The AutoUpLinkUSA Internet Inventory Management (IIM) System is a user friendly visual presentation of your virtual showroom. IIM gives you total control over your Internet inventory listings. 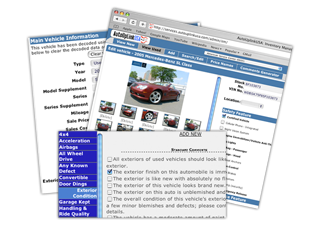 Add, delete, or update vehicles in your online inventory; upload photographs, enter descriptions and individual vehicle comments. Use the AutoUpLinkUSA Comments generator to add personal descriptions to each individual vehicle. Select from a wide array of stock comments or save your own commonly used comments.